People – grab your wands and let the Hidden Object magic begin as you play The Magician’s Handbook 2: Blacklore! After saving Cursed Valley and becoming a pupil of the wise Wizard in The Magician’s Handbook: Cursed Valley, our hero was looking forward to a life filled with adventure and mystery. Unfortunately the Magician’s Handbook became useless and our hero returned home to his unexciting life. Now, two years, later the Magician’s Handbook is starting to come alive again with the voice of Corrigan, the fairy helper to the wizard and he desperately needs our hero’s help! It’s now your job to help free the captured magicians and trapped fairies by stripping the extremely powerful and evil magician pirate Blacklore from his powers. However, as our hero wasn’t born with magical powers, his aim is to collect enchanted objects, which will allow him to cast spells. The brilliant thing about the game is that the hidden object lists in the various chapters are randomized, so if you play the game or chapter again you will most likely have a different selection of objects. Each chapter comes with just five hints but… fear not! Once you have used them all up they slowly recharge again. Alternatively, you can search for hidden keys in each scene, which open treasure chests that hold additional hints, magic wands and spells. The keys have different colors; gold, silver and black and each chest requires a different colored key and also a different amount of keys to open it; some treasure chests can be opened with one key, others require seven so you should really save them up. 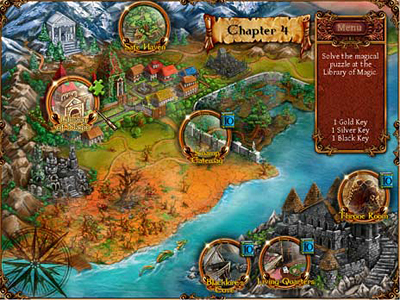 Each chapter requires you to find the hidden objects, followed by a mini-game that requires you to return the objects to their rightful place. 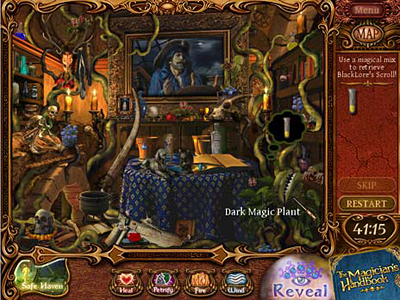 Finding enough enchanted objects allows you to learn and practice spells, which will then be used for solving the chapter’s puzzles. 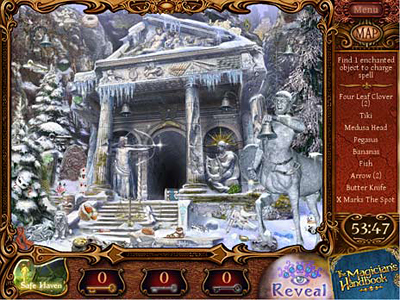 Another great thing about this hidden object game is that as you play, there helpful pop-ups in every scene that explain what you need to do, plus there are additional explanation in the right-hand sided menu. You can also refer to the Magician’s Handbook at any time to review the chapter’s goals. While the theme of the game is enjoyable and the little extras are fun, like being able to change your wand for example, at times it feels like a magnifying glass is in order, as some of the objects are tiny and very hard to find. However, the game does have various settings and can be played in Casual mode, which is easy-going without the stress of a timer, allowing you plenty of time to look for objects. Or if you feel like a challenge, play in Apprentice mode, which adds the timer. So the bottom line is… are you ready to spread some magic? Download and play The Magician’s Handbook 2: Blacklore and find out! I really enjoy all of Free Rides games, Especially the puzzle and hidden object, Thank you. I have tried quite a few games Love to play them! It looks like there might be a coding error in this ad. Thanks for bringing it to our attention, I have forwarded on to our advertising department to look into it. I really like the freeride games… Glad i found the site!! My favs are the hidden object games. We really love the freeride games… My daugther turned me on as her guest frist, Now we can’t do without you or freeride,please keep new hidden objects coming…very releaxing after my hard days work every day i mean it, you’ve bought a marriage back together again and God bless you all for this we wish all of you a very HAPPY HOLIDAY & a safe one. Denise & Family thanks rika for turning Mom on,Thanks freeride. Thanks for all free games, I really enjoy all of Free Rides games. Glad I found the site!! 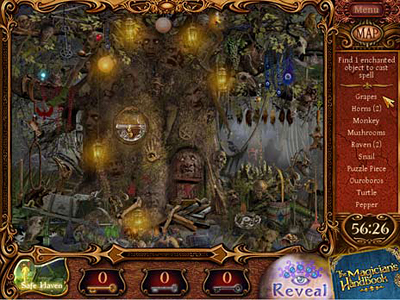 My favs are the hidden object games. Just found your game, Magician’s Handbook2. It looks very interesting and the different levels look exciting. Can I buy this game? Thank you. No need to buy the game – you can download the full version for FREE! Note that it’s NOT a trial, it’s the full version (there’s no time limit, you can play it whenever and as often as you like). Enjoy!